Sora is anormal high school student, he lives with his sister Kaede as their fathertravels the world for adventure and discoveries. One day, Sora receives a big package fromhis father, who is in Egypt now. He is a bit concerned, every time hisfather sends something; it ends up cursed, causing problems. The size is an issue, inside comes ahuge coffin, and his father letter says he has found a cute mummy, and thathe will leave it at home. That does not eases Sora’s mind, especially once the coffinbegins to open. He tries to prepare for the worst, but something is not right, a tiny mummy comes out the coffin. Itfits the palm of a hand, and seems completely harmless; however, Sora thinks itis best to return it to Egypt. However, as soon as he pushes the mummy inside the casket, tears come out andwet the floor; the little mummy does not want to leave. Sore tries to figureout what he should do, and researches more about mummies. At that point, the dog enters the room looking for Sora, he begins to pet it,without noticing the mummy also needs attention.As the dog barks, the mummy decides to do the same; Sora is surprised, moreonce the mummy jumps into his back. 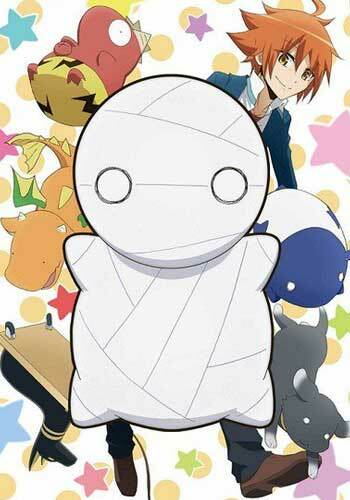 He ends up keeping the mummy, naming his new little friend as “Mii-kun“. However, living with amummy might be easier said than done. A manga series by Kakeru Utsugi. It has been serialized online via Comico Japan since 2014. An anime series adaptation by 8-Bit premiered on January 11, 2018.